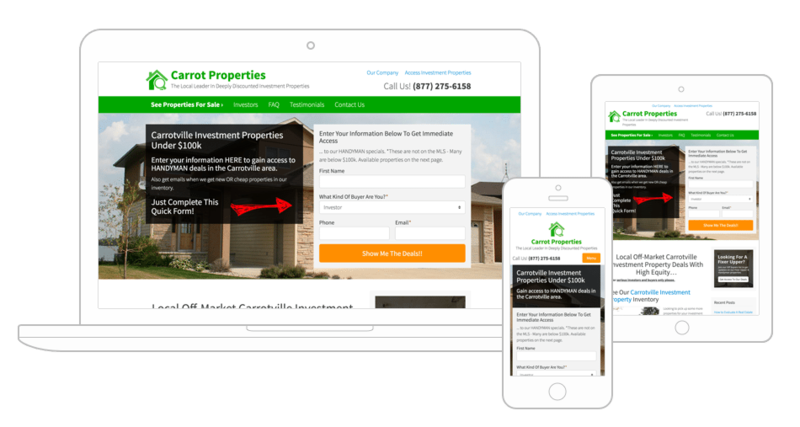 Learn how InvestorCarrot websites can streamline the way you sell your properties. Having cash buyers is critical for house flippers and wholesalers. With InvestorCarrot, launch an effective cash buyer website in seconds, and put it to work in your business without the tech or marketing hassle. Like all of our websites, our cash buyer websites are built with our Carrot Conversion framework. That means they convert more visitors into qualified leads than the average investor site by far. Let our 2-Step cash buyer qualification process weed out the tire kickers for you. We do the strategy and tech thinking so you don’t have to. The difference between a cash buyer website that performs at a high level and one that doesn’t often times is many small tweaks stacked up. We love technology and marketing and aim to make your life easier by baking our knowledge on both into our websites. The result is you never have to worry about tech issues, don’t have to have years of SEO, conversion rate, or marketing experience. Just launch a cash buyer site, follow our marketing system, and our sites turn your visitors into qualified leads. Over 51% of the tens of thousands of leads our Carrot members generate per month now come from mobile devices. So it’s important to have a well designed and high performing mobile responsive website design, now more than ever. Every page on your new Carrot websites has been designed from the ground up to not just look great on mobile and pass Googles “Mobile Friendly” test, but also to convert mobile visitors into leads. 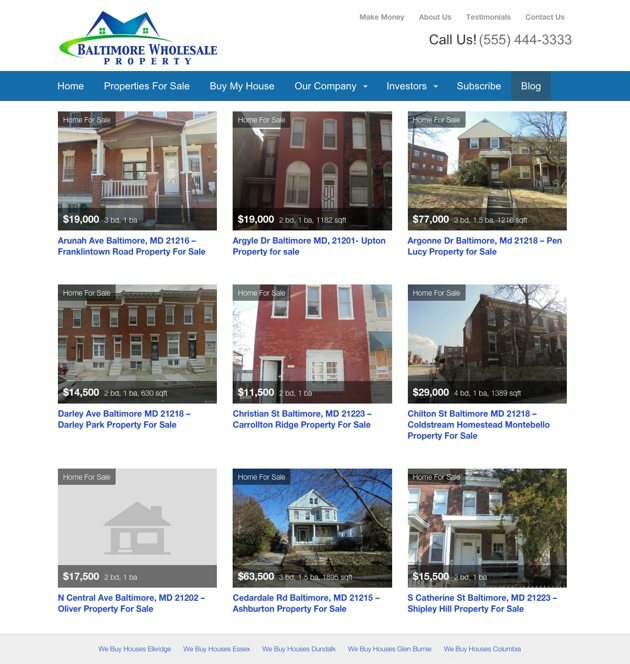 Even your property listings on your cash buyer websites look great on mobile so you can sell more properties and deliver a better experience for your cash buyers. One of the best parts about InvestorCarrot’s websites are the automation built into them. 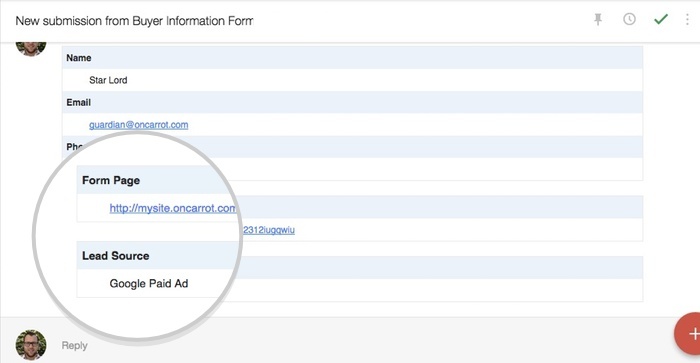 With a few configuration settings you can send cash buyer leads to your preferred email campaign or CRM. An autoresponder will be sent out from your InvestorCarrot account informing the lead they are now going to be getting market exclusive deals on deeply discounted properties. From here you can send all of your leads to a service like Podio, Zoho, MailChimp, Aweber, Freedomsoft, or other CRM. Having private lenders is a valuable tool in every investors arsenal. But it can be tricky attracting private lenders online in an SEC compliant way. After many tests, we developed a deceptively simple yet effective way to turn on average 10% of our members cash buyer leads into private lender prospects through our 2-Step qualification process. It’s already baked into every InvestorCarrot cash buyer site from day one. We’re continually testing and tweaking our designs and our system so our members stay ahead of the curve. “Smart” features like our landing page builder, social media integrations, built in blog and SEO tools, return access to prevent your leads from having to opt in if they’ve already joined your list, automatic image compression (to keep your page sizes small and load times fast), and more are built into every Carrot website. All working behind the scenes so you can focus on what you do best. I recently watched your video on building a cash buyer list first. It was very helpful, gave me a few ideas, an pointed out a few things I’m doing wrong.